ambioSonics is my main music project. https://soundcloud.com/fanwander, my private soundcloud account; mostly used to put some sound examples online. But you will find also some tracks I do on my own. Service Manuals: This is a link to Rob Senso's website. He offers a huge collection of exceptional scans of service manuals for all kinds of electronical musical devices. You can download them without restriction, but I ask you to be fair and donate a little money as he asks you on top of his page. If you did so already, the you may scroll down on his page. I removed all service manuals from my page with exception of those, which are not available at synfo or which I scanned in better resolution. ADA STD-1: a sound example of this great analogue multitap chorus unit. Arturia Minibrute: Some pics from the inards of the Minibrute, and better pcb layout plans. Akai S612: Info about the first Akai sampler ever. The complete service manual for the S-612. Some description of the less known multisampling upgrade. Editing software for Atari. PlanB Milton: schematics and two pictures of a Milto sequencer from Peter Grenaders "Plan B"; I once was asked, whether I could repair this one, and the customer sent me these data. But in the end the job was canceled. As it is a rare piece, I decided to publish it here. All rights by Peter Grenader. Casio FZ-1: service manual, zip-archive with photographs from my orignal paperversion. Dynacord Percuter: Pictures of my percuter, boomer and sequencer. This gear has been stolen between 24th of December 2016 and 2nd of January 2017 in Berlin. Serial numbers are: Dynacord Percuter S #10041, Dynacord Big Brain (Sequencer) #10113, Dynacord Boomer (Prommer) #10115. Harms MAC16: Some information on a rare 16-channel MIDI-CV interface (incl. Ownersmanual). Korg Minipops MP-7: Schematics of the Korg Minipops MP7. Korg MonoPoly: Modifications, tuning instruction, pictures, schematics / service manual for the Korg MonoPoly. Korg MS-20 SERVICE MANUAL: service manual as PDF (courtesy of vintageplanet.nl). Korg Polysix: schematics / service manual for the Korg PolySix. Chord-Trigger module for the Polysix and Poly61. 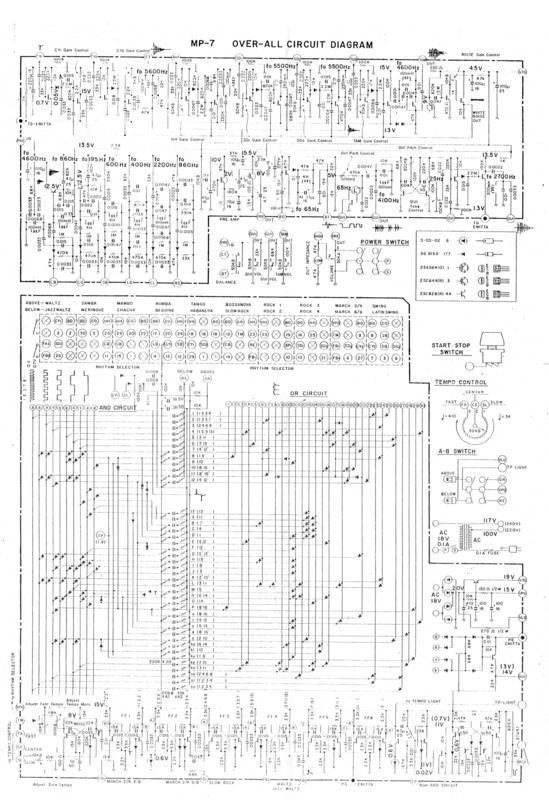 Korg Poly61: schematics / service manual for the Korg Poly61. I don't own a Poly61, but I am thinking about to use its voiceboard as an extender for the MonoPoly. Korg SQ-10: high resolution scan of the service manual for the Korg SQ-10 sequencer. Lexicon Jamman: pictures of the replacement of a broken rotary encoder in a Lexicon Jamman. Moog Parametric EQ: Some pics from a repair of a Moog Parametric EQ - these are especially examples for the misuse of contact cleaner on potentiometers. Moog Phaser: repair of a Moog Phaser - broken switch for stage countr. Moog Polymoog: servicemanual of the Moog Polymoog as PDF. Oberheim DS2a: I bought this old digital sequencer some years ago, but never managed to get it running really. At the moment only two pictures. The Service Manual is available too. Oberheim OB-Xa: pictures and service manual. Quantec QRS: owners manual and service manual. Roland JX3P: info, tipps, schematics, and modification on this roland Synth. Roland Juno-6 / Juno-60: A chord trigger modification for the Juno-6 or Juno-60. Also some pictures of my incredibly rotten Juno-6. Roland Jupiter 4: a few pictures of a mod i made to the voicecards of the Jupiter 4, to enable/disable voices. This makes the tuning procedure much easier. Roland SH-1: pictures of a replacing the 100V-transformer by a 230V torroid transformer; picture of a panel switch disassembled. Roland SH-101: service manual and some modifications. Roland System 100: service manual, schematics, owners manual, patchbooks. Roland System 100m: schematics and two sound examples. These pages are mainly a simple gallerie, which uses the scans, that are available at Analogue Heaven. On analogue heaven there is no possibility to walk through the schematics. Roland System 700: schematics. I don't own a System 700, so please don't ask me questions. Roland Filters: an overview on all types of voltage controlled filters used in analogue roland synthesizers. Roland Ensemble and Choruses: an overview on all types of string ensemble effects and chorus'es used in analogue roland synthesizers (work in progress, not complete). Vestakozo (Vestakaza) DIG-420: Some info on this very interesting vintage Audio Delay. A simple headphone amp: The circuit is derived from the headphone amp circuits in the later Roland synths. synth meeting 2010 "Synthesizertreffen München"
mountains; my other passion is alpine ski mountaineering and hiking in the mountains (public accessible pages).